FOR volunteers have been helping a researcher from Victoria University with his field work. The work in the RNRP for the last two months has been dominated by the trap replacement project. We have had our first volunteer for the summer start, with volunteers staying for four-week stints throughout the summer to help with biodiversity work and gain experience. Summer trainee ranger Bekki has started and will be with the biodiversity team for the summer. We are currently working to replace all our mustelid traps with new double-set trap boxes. Two types of trap box are being deployed, a “best-practise” type that is the current trap box design used by DOC and a new “run-through” style that is more open. The focus of September was on constructing the trap boxes, with the wooden frames constructed by a lumber company but all the additional bits needing to be fitted by staff. This is a long process, but we are now almost finished this stage. At the start of October bundles of trap boxes were flown into Big Bush, with some skilful helicopter work seeing these all lowered through the canopy right onto traplines. The remainder of October was spent putting these trap boxes out with teams working together to place the traps along the lines and then set the traps up. Each box is pegged down and then traps tested so that they will spring off when a 100g weight is placed on them but will not spring off when the other trap in the box is triggered. Adjusting the traps to achieve this is quite a fine art. The Big Bush and Teetotal area have now been completed which is approximately a third of the traps in the network. At the start of November, the first lot of traps for the St Arnaud Range was flown in, and the old traps from Big Bush were flown out. Phil and Fiona Borlase kindly let us fly from one of their paddocks which significantly reduced the ferry time of traps under the helicopter. On the first attempt the old traps from Big Bush were successfully retrieved but then unfortunately the wind increased, and the pilot was not able to fly in the new traps for the St Arnaud Range. A week later the weather played ball and we were able to get 16 bundles of traps dropped onto the hill ready for deployment. Possum captures have increased slightly in Big Bush with seven caught in September and nine in October. We will be continuing our clay-based lure trial in Big Bush until the end of the year. locate her new nest, which will not be easy given the terrain, and hopefully it will be within the protection area. November is a monitoring month in the RNRP, with rodent and mustelid tracking tunnels to be done along with five-minute bird counts. We will begin monitoring kaka for nesting in response to the large amount of beech flowering we are currently seeing. The four transmittered kaka will be checked on weekly for nesting, and old known nest cavities will be climbed and checked for signs of activity, with cameras installed in favourite cavities. In December we will carry out the annual long-tailed bat monitoring work we started in 2017, with recorders placed at Rotoiti and Rotoroa. We will continue with the trap replacement project with the traps being deployed on the northern end of the St Arnaud Range, and eventually more bundles will be flown onto the remainder of the range. 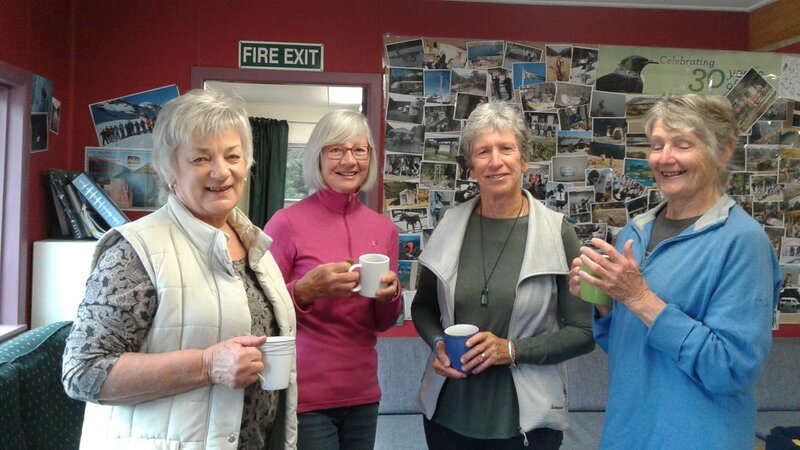 Volunteers and supporters gathered to enjoy morning tea and raise more funds for our GSK project.